Gerry believes it is his role to ensure that this unique and special day runs smoothly and that the bridal party are stress-free and able to enjoy the day with their guests. He is not there simply as a Toastmaster but as a figure who will ensure your special occasion goes to plan therefore allowing the wedding party to relax and enjoy the wonderful day. He is also prepared with any words of advice and support at an emotional but happy time. 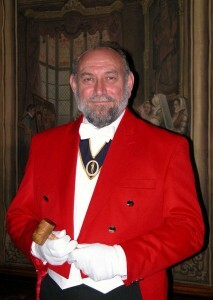 Gerry ensures the Toastmaster service he offers is personal and well informed. By meeting his clients prior to the event, he is able to discuss their requirements and get to know the individuals involved. This service has proved successful in making the wedding breakfast an occasion to be remembered for each and every day of the newly-wed couple’s life together. As well as wedding receptions of all cultures, as a Toastmaster Gerry is also available for corporate dinners, dinner dances, Gala Balls, Masonic Ladies’ Festivals or reception, Rotary Club functions and Round Table functions. With a First Class Diploma from the School of Essex Toastmasters, Gerry is highly qualified and can bring that extra special quality to a wide variety of functions. In addition, he brings to the role a wealth of experience and skills developed through the organization and hosting of presentations, seminars and conferences in his role as General Manager of an international lighting company. On many of these occasions Gerry acted successfully both as spokesperson for his employer and as an experienced industrial figure, serving on a Parliamentary Committee for the lighting industry. Contact Us | Copyright © 2015 Gerry Tovell. All Rights Reserved.